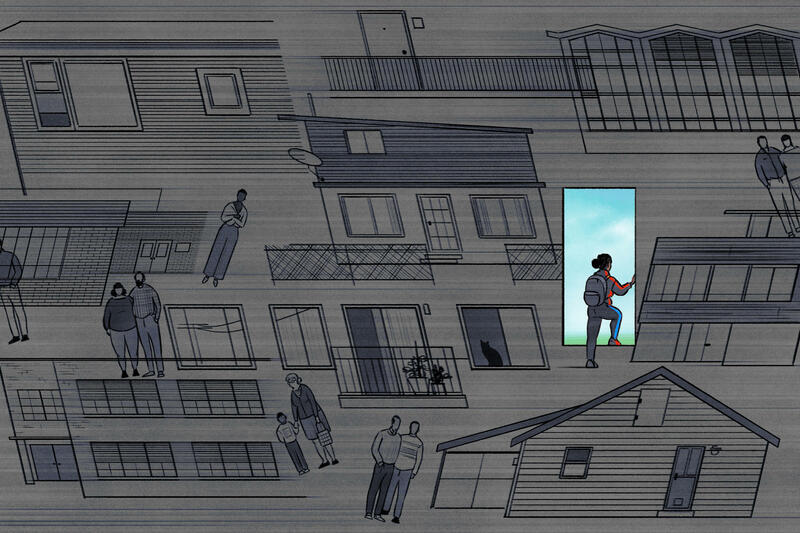 A few years back, the high school graduation rate for Seattle students in foster care was only 36 percent. A nonprofit there set a five-year goal to improve that number, and the results were impressive. Anya Kamenetz of the NPR Ed team looked into this as part of a series we're calling Take A Number, focusing on a problem through the lens of a single number. Here's what happened with that 36 percent graduation rate. ANYA KAMENETZ, BYLINE: It's 7:30 a.m. on a dark and foggy fall morning. Crows are circling the soccer field at this high school in a suburb of Seattle. Inside, Tajiana Ellis is welcoming students to her office. KAMENETZ: Ellis works for a group called Treehouse. Her title is senior education specialist. ELLIS: We're a little bit of a teacher, a little bit of a counselor, a little bit of a mentor, little bit of a parent, little bit of a friend. KAMENETZ: Ellis wears all these hats for one reason - to get 15 foster kids to finish public school. She cheers at basketball games, sets up job shadowing, internships. She takes students to get their hair done. They're little things but things foster youth don't always get - plus one big one. ELLIS: Our official responsibility is to check in with these - on their ABC data, which we identify as attendance, behavior and coursework. KAMENETZ: Ellis sits here and checks in with students one at a time at least once a week. Ellis is friendly with the kids, but she doesn't let up. ELLIS: All right, so how's everything going? Do you need, like, help? Are you having a hard time understanding? What happened? That's all you can give me? Are you OK? KAMENETZ: Even Mechelle, one of her stars, is often closed-mouthed like any typical teen. ELLIS: There's a lot of just sounds that you're giving me. MECHELLE: It's fine I guess. KAMENETZ: Mechelle is a junior earning A's and B's in advanced classes. We're using her middle name to protect her privacy. She's also the co-captain of the basketball team. Today she's wearing her varsity jacket and matching red Jordans. Mechelle was adopted from foster care. She doesn't like to talk about it even with her friends. MECHELLE: 'Cause then they be like, oh, then what happened to your mom and stuff? And it's just like, none of your business. KAMENETZ: Her adoptive mother Pearlie says there are some bad memories. Mechelle has two older sisters. One of them is a mother at age 19. The other one is 18 and doesn't see the family much anymore. Mechelle says everyone is counting on her to beat the odds and get her diploma. It seems like a lot of pressure. MECHELLE: Yeah, and it's also me. Like, I want to be better. And it's not always my mom telling me that I should. KAMENETZ: Foster youth need that kind of determination. Being taken away from your family is a trauma no matter the reason. Most of these children have mental health needs. Many face addiction, brushes with the law. And the state's care ends at age 18 or 21 at the most, an age when middle-class kids can still depend on their families. On top of that, these youth are switching schools all the time. The child welfare system's priority is their safety, not necessarily their report cards. Most foster kids have no one specifically focused on their education. That's where Treehouse comes in. Janis Avery has led the nonprofit for two decades. At first they provided extras to foster kids like backpacks, school clothes. They still do all of that, but a few years back, Avery got some bad news about the outcomes for students in Seattle. JANIS AVERY: We learned in 2010 that our high school graduation rate here in King County on time - 36 percent. AVERY: For kids in foster care. KAMENETZ: Any way you cut it, that number was terrible. AVERY: We were shocked. I mean, really, tears flowed. KAMENETZ: So Treehouse ripped up their plans and rewrote their mission statement to make education their No. 1 goal. The results exploded their expectations. Last year, nearly 9 out of 10 of their students earned a high school diploma within five years. That beats the state's graduation rate for all kids, not just foster kids. And 63 percent have made plans for college or job training, too. Treehouse is pledging to keep supporting them until age 26. This year Treehouse expanded into two more school districts - next stop, the state as a whole. And Avery tells us on her walk to work that she thinks the model can work nationwide. AVERY: And so we'd like to take some of that randomness out of youths' experience. KAMENETZ: As for Mechelle, this spring, she will be traveling across the country visiting historically black colleges as far away as Atlanta. MECHELLE: I just want to go to a black college to learn more about myself because, like, in regular school, you really don't learn much about black history, so it's - I think that's very important to me. KAMENETZ: Traveling with her will be Tajiana Ellis, her Treehouse education specialist, offering support no matter what comes. Anya Kamenetz, NPR News. Transcript provided by NPR, Copyright NPR.